Set oven at 350. Grease a 9×13 inch pan. Melt chocolate chips and butter. I like to use the microwave, in 30 second intervals. Stir gently with a spoon or butter knife between intervals until all the chocolate has been melted and the mixture is smooth. Set aside to cool. Note below for why. Combine sugar and espresso/coffee mixture together. The sugar will melt a bit in the coffee and the brownies will be smoother without sugar crystals. Also, water causes chocolate to seize and mixing these separate will help prevent seizing. Combine coffee mix into the chocolate mix. Beat eggs and vanilla until smooth in a large bowl. Combine all remaining dry ingredients. Set aside. Once the chocolate mixture has cooled, warm but not hot. Add the chocolate to the egg mixture. I beat the chocolate mix into the egg in about 4 parts. Beat until all integrated and smooth. Fold in the flour mix in 3 parts. 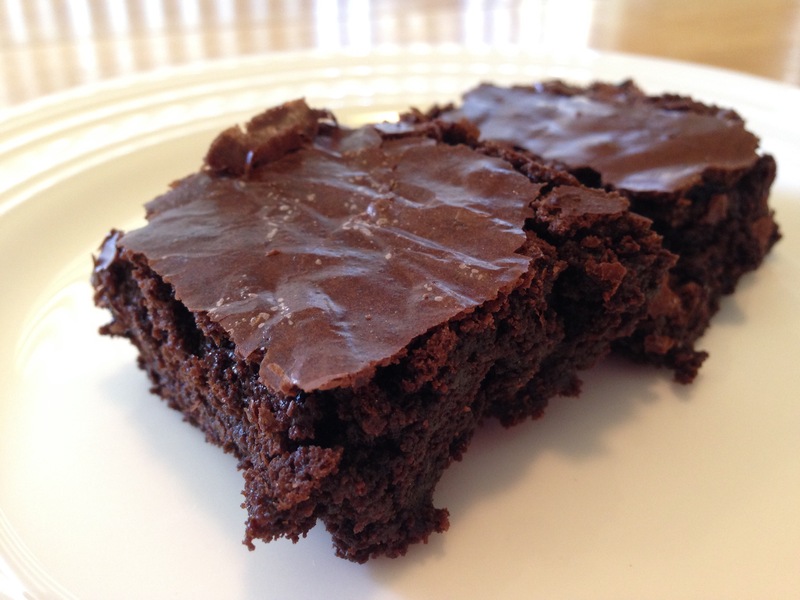 Over mixing batter yields tough brownies and lets face it… who wants that? Not me! Pour into pan and place in oven. Bake for about 45 minutes or until toothpick comes out clean. If there are some crumbs stuck, it’s alright but not wet batter. Careful not to under bake as it’ll be soupy. Let cool before serving. When greasing a pan, use either baking spray or butter/shortening with cocoa powder. Baking spray is better than regular nonstick spray because of soy lecithin. That is what causes that burnt on stickiness that’s near impossible to clean off. Make sure to get a baking spray that does not have soy (I use baker’s joy). Also! Good to grease with butter or shortening and then dust the grease with cocoa powder rather than flour like in traditional baking. When baking anything that’s chocolate it’s better to dust with cocoa powder so you don’t get a white residue on your beautiful chocolate baked goods. I use the microwave rather than a double boiler method because it’s far easier to control for moisture and heat. If you burn your chocolate it’s useless and if chocolate gets moisture while melting it “seizes” and is also useless. So! I microwave. Plus, it’s fast and I’m a little impatient. Careful not to over heat in the microwave. That’s why I recommend 30 second intervals.